Pollination refers to the transfer of pollen, a dust-like substance, between flowers of the same species. Some kinds of plants are wind-pollinated, including all the grasses, cereal crops, and various kinds of common trees such as Oak and Ash. Plants that are not wind-pollinated use insects transfer pollen between flowers. So when we refer to 'pollinators' (in the UK and Ireland) we mean flying insects. Much attention is given in the media to the economic value of certain pollinating insects, mainly bees, that pollinate some of our food crops, such as soft fruit and fruit trees. But the issue is not just about economics, and it is a pity to reduce it simply to this. Less attention is given to the vital role that many kinds of insects play in cross-pollinating wild flowers, maintaining the genetic diversity and the long-term viability of our populations of wild flowers. Even less attention is paid to the pure joy, for its own sake, of seeing a garden full of pollinating insects. 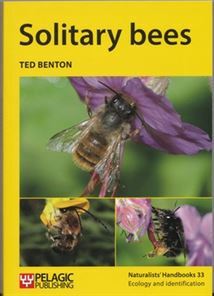 Although it is often assumed that most pollinators in Britain and Ireland are bees, this is not the case. Insects from a number of different families visit flowers. 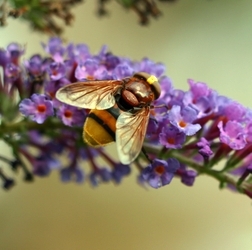 A significant proportion of flower visits are made by various types of flies, such as the hoverfly illustrated here. Pollination refers to the transfer of pollen, a dust-like substance, from the male parts of a flower (the stamens) to the female parts (the stigma) of the same species. Some kinds of plants are wind-pollinated, including all the grasses, cereal crops, and a number of kinds of trees. Plants in Britain, Ireland and the rest of Europe that are not wind-pollinated use insects as 'go betweens' to transfer pollen between flowers. So when we refer to 'pollinators' we mean insects. The insects visit flowers seeking food and incidentally carry pollen on their bodies and transfer it between flowers. Some types of insects drink nectar (a sugary liquid secreted by many flowers), other types of insects eat pollen. Some do both. These substances are the food rewards that attract insects. 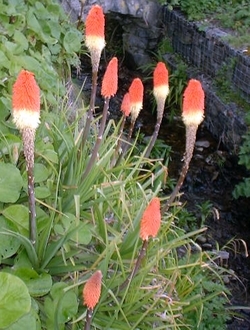 On the other hand many flowers that originate in the southern hemisphere, such as the 'Red Hot Poker' or Kniphophia illustrated above left are adapted to pollination by birds (or in some cases pollination by bats or other mammals). In North and South America hummingbirds visit flowers. Flowers that are adapted to pollination by birds or mammals often exhibit shapes and colours that attract their specific pollinators, and for this reason may not be very accessible to insects. This is the main reason that most exotic southern hemisphere flowers are not much use for pollinator-friendly planting schemes in the UK. Insects and Flowers compares the different ways in which various types of insects feed from flowers.